Read.Write.Repeat Episode 1: A 30-minute mini-episode in which we discuss gateway books to a reading addiction, awkward bookish moments, and our goals with this podcast. Welcome to Read.Write.Repeat! We are excited to have you. Kaisha owns a bookstore and has worked in the book industry forever. She is THE bookiest book nerd of them all. You can check out her awesome bookstore here. She sells used, out-of-print, and antiquarian books. On top of that, she is one of the most well-read people I know. I go to her for all my book needs. She never steers me wrong. I am Kelsey, and I am a struggling writer. I’m not starving, but that is only because my husband works for a living. I work for…well, right now it seems as if my efforts have only been rewarded with agony and rejection letters. Mostly. I have recently been accepted into a Masters of Fine Art in Fiction program and was offered several scholarships based on my writing, so I guess not everybody is rejecting it, but I have yet to sell a manuscript, and my writing demons won’t leave me be. You can check out more of my crazy writing here. Bookish Rants with Kaisha–Come along as Kaisha talks about her most recent bookish nirvana, discusses reading related injuries, or talks about the antics of her quirky customers. The topic is book love, and the scope is endless. Author Rants with me–I promise I won’t always be whining about my most recent rejection letters. Together we will contemplate my pantsing struggles (and I’m not talking about keeping my pants up), my wildly inappropriate writing ideas, the crazy situations I find myself in, and my penchant for trouble. The topic is writing passion, and the road is bumpy. Prompt Up–I will provide you with a fun writing prompt to inspire your imagination. 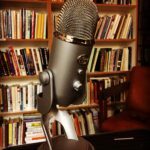 Short Story Powwow–Kaisha and I will be discussing short stories each episode from both a readers and writers perspective. We will announce the story in the previous episode. In Episode 2, our first full episode, we will be reading Rip Van Winkle by Washington Irving. Nerd Girl Lit–In light of the story we have read, I will be introducing a literary term, movement, or concept in the nerdiest way possible. In our Rip Van Winkle Episode, Termagant Women, I discuss the Romantic Era using Captain Kirk from Star Trek. Books, Quirks, and Intrigues, Oh My!–In this section, we build off of what we’ve discussed earlier, circle back, connect it to bookstore or publishing trends, unite things, and follow random ideas that pop into our heads as we talk. Kaisha asks me what my gateway book was–what book lead to my reading addiction. For me, those books were The Ugly Duckling by Iris Johansen and Tick Tock by Dean Koontz. Kaisha’s book was Ride the Wind by Lucia St. Clair Robson. You will find no book shame here. We read everything. While we love our classic and higher literature, we also enjoy our genre reading. What happened when my high school history teacher wanted to borrow my raunchy romance book? How did Kaisha get out of trouble when she spent an entire science class reading, and the teacher called her out? We will share these stories and more as we give you a bit of insight into how we became the voracious readers we are today. Our first full episode, Rip Van Winkle and Termagant Women will be out June 18th! You two are delightful. I am looking forward to geeking out on all of your podcasts. Yay! Thank you, Lee! Happy listening!